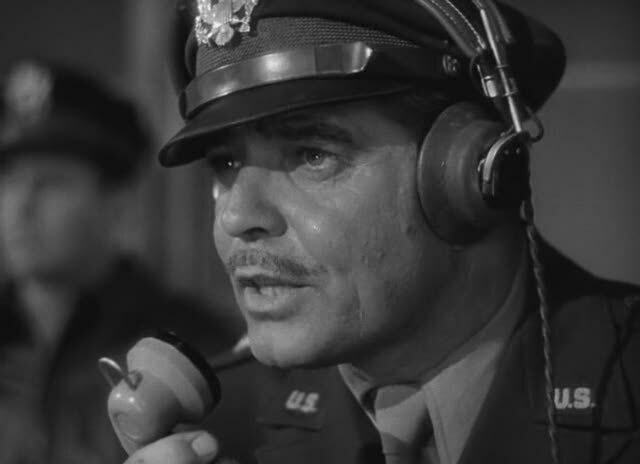 COMMAND DECISION, adapted from a hit play, jumped the gun in 1949 by beating Twelve O’Clock High into theaters by ten months, but the latter film drew more acclaim and awards, and has been remembered (it’s also better) while this has been forgotten by all but WW2 movie collectors or Clark Gable complete-niks. Almost completely setbound, it’s all talk, some of it pretty good, about the stresses of officers in charge of ordering hazardous, high-casualty air raids into Germany. Sam Wood directed, and it sometimes feels like he rushed the actors, as too much of their interplay sounds like dialogue just professionally recalled rather than actual human-speak. Still, Gable is solid, Walter Pidgeon has a fine seven-minute harangue good enough to keep him on at MGM for another spell and Brian Donlevy has some honestly felt reaction shots he could be proud of. 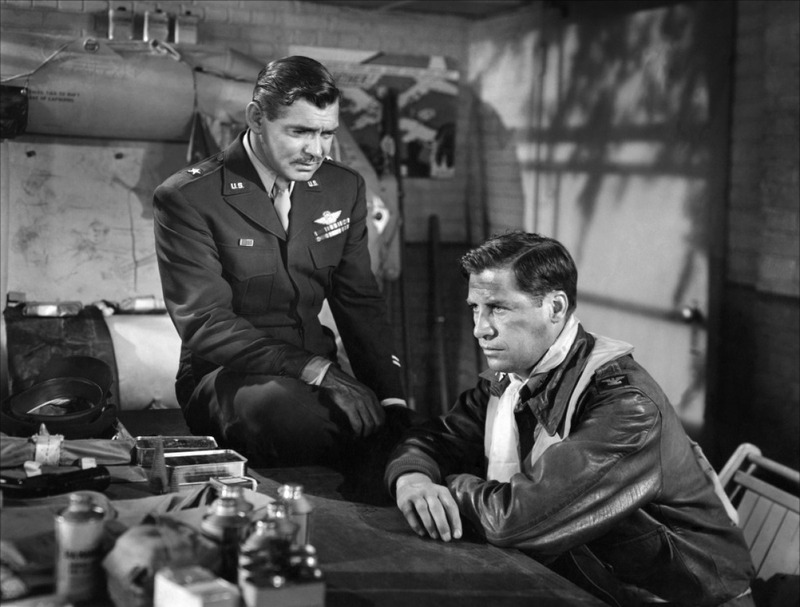 Throw in John Hodiak, Edward Arnold and Charles Bickford and you’re guaranteed of strong backup. There’s enough manly cigar-smoke in this movie to tax Cuba. Maybe it was the cast or some unseen reason (few sets, no crowds or action) but the film cost a hefty $2,500,000, and so its decent $3,500,000 take still didn’t cover it enough to avoid a loss. 112 minutes, with Marshall Thompson, Richard Quine, Cameron Mitchell, Ray Collins, John McIntire and Warner Anderson. * Mitchell had been a bombardier during the war and Gable of course was known for his service. No doubt the generals and colonels who had to follow policy and make the calls as to how many men to send where & why had plenty of sleepless nights. I wonder what my Uncle Bill, who was a tail gunner in a B-25 during those nightmarish raids, would have thought of this well-intended drama? Like the commanders, he had anxious nights. 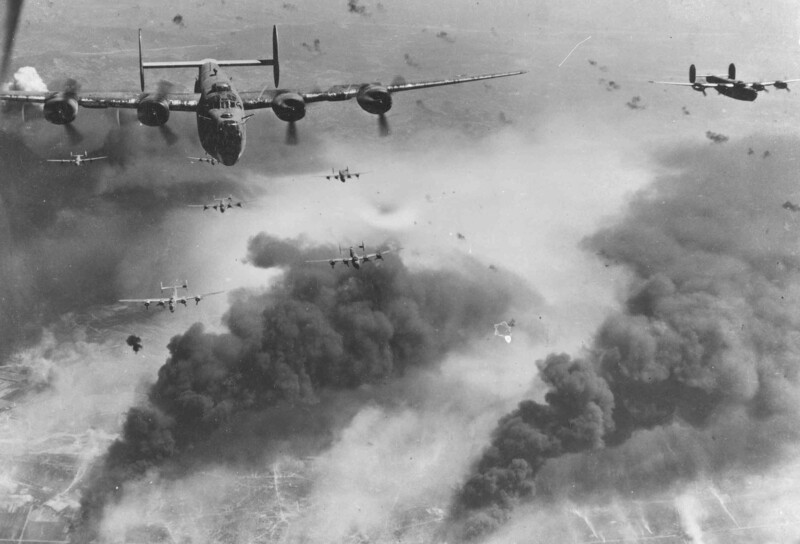 His daylight hours—over Europe—were marked by freezing temperatures, the thunder of engines, hammering .50 caliber machine guns, screams of dismembered pals, faces glimpsed of German pilots as they streaked by, and the ant-scurry of soldiers and civilians on the ground desperately running to escape from bombs. The first sight greeting him on arrival in England was a B-17 blowing up on the runway. Shot down once: after the crew bailed out, it took a week of desperate evasion to get back to safety. Memory says they made it via Sweden, but there’s no one left from those days to ask. 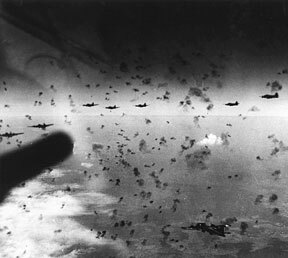 On another raid his squadron dropped their bombs on our own men by mistake. He returned, at 21, a nerve-shattered basket case. He threw away his medals. He’d stand at attention to salute the flag during parades, because he knew there is a time to fight and to honor those who do it for us. In 1968, he looked forward to voting for Bobby Kennedy to stop the lunacy in Vietnam, because he knew fighting and killing for the wrong reason was a sin. A troubled man, he was a wonderful uncle, and as a boy I looked up to him as a War Hero. I always will. Asked about WW2, he could speak about it for maybe a minute before weeping. He did his part in smashing Adolf Hitler’s insanity, but my quiet, gentle Uncle Bill never got over those Command Decisions.